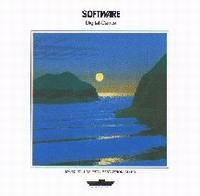 Uneven but still enjoyable album from SOFTWARE. The line up grows, evolves and moves away from their hypnotic robotic sounds of their debut. They soften their music by widening their instrumental palette : bells, saxophone and an electric guitar very reminiscent of Edgar Froese's playing on the TANGERINE DREAM albums "Force Majeure" and "Tangram". "Digital-Dance" is overall very relaxing and alternates floating pieces ("Magnificient-Shore"), atmospheric tunes ("Island Sunrise", "Sea-Gulls-Audience") and for sure synthetic tracks ("Oceans-Breath", "Digital-Dance") with odd passages ("Waving-Voices"). Soundscapes are very reminiscent of the electronic German pioneers' music in the middle of the 80's.